My favorite recipe for Chocolate Chip Cookies. I added in some caramel bits and chopped pecans for a decadent, chewy delight! I don’t bake cookies very often in the summer. Isn’t that strange? It’s not that I’m against turning my oven on or anything, I just don’t think to do it. During the school year I try to bake fresh cookies every Monday. This gives my kids something to look forward to when they get home from school, and it also provides a treat for their lunches for the week. But in the summer, I survive off the fat of the land. I know, I’m dramatic. What I mean to say is I work through my freezer stash. At any given point you can come to my house and I can bake you fresh cookies in minutes upon arriving. Or, better yet, hot cookies out of the oven right when you walk through the door. Last week on INSTAGRAM I shared my secret. And it seems many of you do this too! I usually bake a double batch of cookies on Mondays (or really any time of make cookies, I double it). Once the dough is made, I scoop a couple dozen (or half the batch) into balls, place them on a parchment paper lined baking sheet and freeze them. Then I continue baking my cookie dough as normal. When everything is baked, I grab that cookie sheet of frozen dough out of the freezer, drop all the frozen balls into a freezer safe Ziploc bag, label it, and return it to the freezer for future use. It’s the perfect solution when you want hot baked cookies but you don’t want to mess with making the dough. Just take out how many cookies you want to bake, and in minutes you have hot, fresh chewy cookies! This is the fat of the land I live off of in the summer. The dozens of bags of cookie dough in my freezer. Although with moving this summer, we didn’t have a stash, so I’m working to build it up! Haha. Actually, I don’t usually save this until summer, I save them until I have a busy Monday and can’t bake cookies. This is an easy way to have my kids help out in the kitchen too. They can bake their own cookies and there’s no mess to clean up! 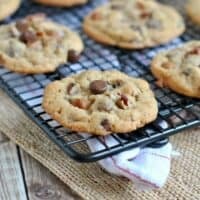 As for today’s Caramel Pecan Chocolate chip cookies, I added caramel bits, milk chocolate chips and crunchy pecan pieces to my favorite Chocolate Chip Cookie recipe.. Otherwise known as “turtles.” These are awesome fresh out of the oven, chewy and amazing! What’s your favorite kind of cookie? I may just have that in my freezer…. 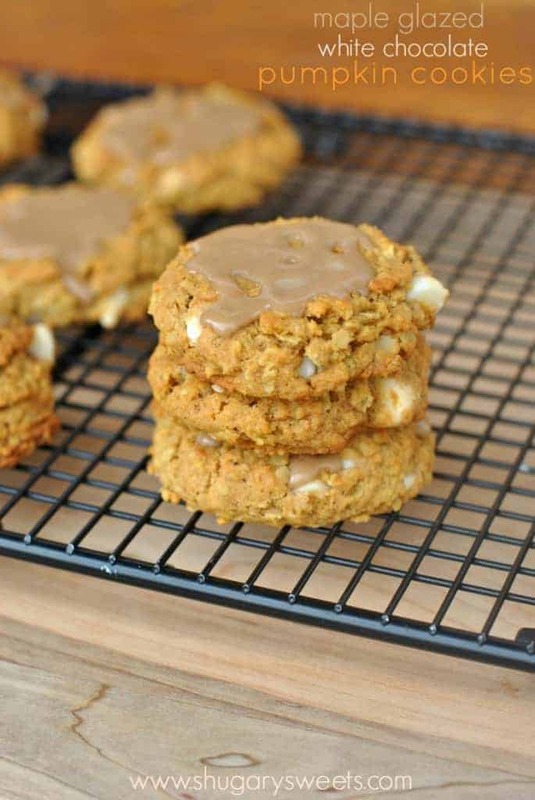 Pumpkin Oatmeal Cookies: it’s never too soon to bake with pumpkin! 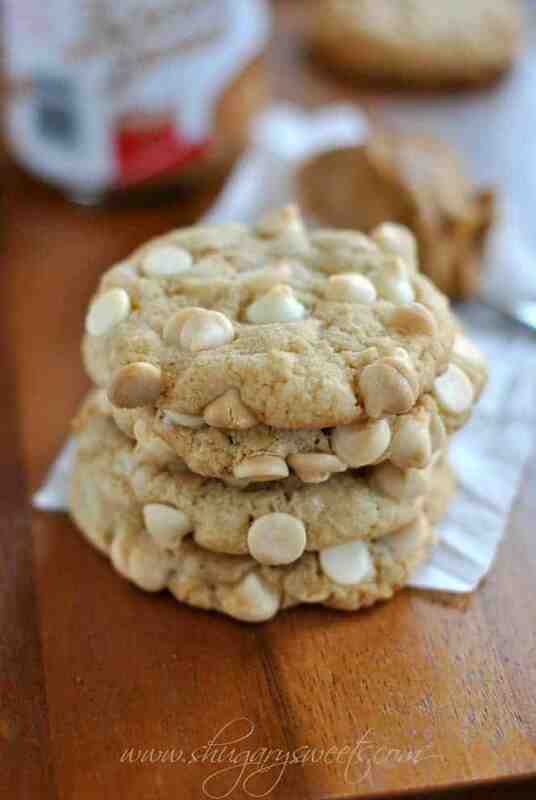 Biscoff Cookies with White Chocolate: such a delicious treat! 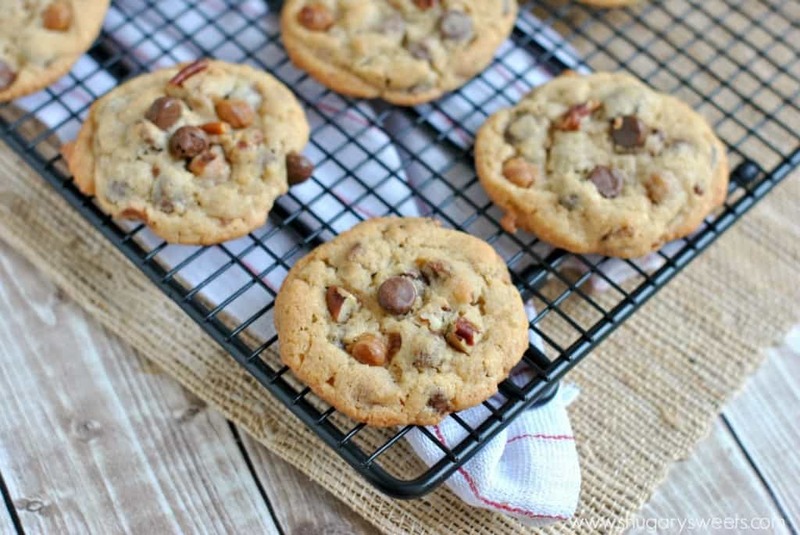 Peanut Butter Cookies with Chocolate Chunk: one of the most requested cookies in our house! In a large mixing bowl, beat butter, brown sugar and sugar until creamy, about 2 minutes. Add eggs, vanilla and milk and beat an additional 2 minutes. Add flour, baking powder and salt and beat another 2 minutes. Fold in chocolate morsels, caramel bits and pecans. 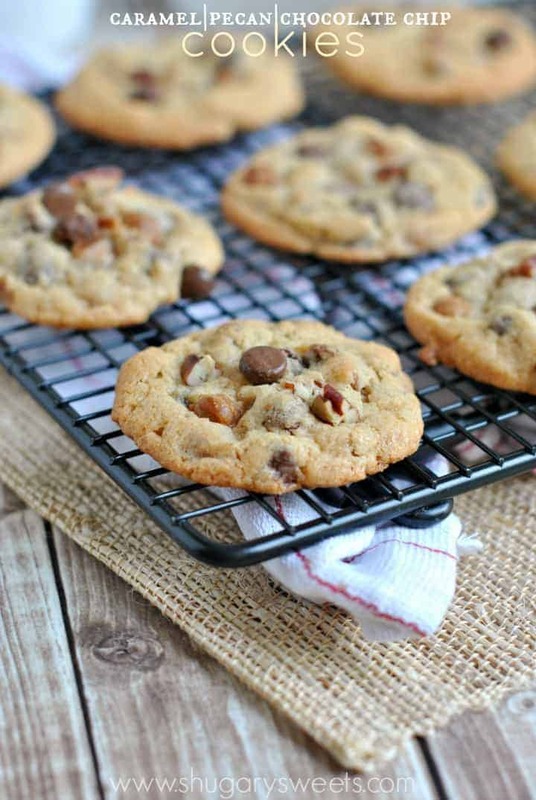 On a parchment paper lined baking sheet, drop cookie dough using a 2 Tbsp scoop. Bake in a 375 degree oven for 12-14 minutes. Allow to cool on wire rack. Store in a airtight container for up to one week. To freeze cookie dough, scoop dough onto a parchment paper lined, freezer safe, cookie sheet. Freeze for about 30 minutes. Remove dough and place in a freezer bag, labeled. When ready to bake, remove desired amount of dough and bake as directed. Add several minutes for frozen dough. I use a pizza stone to bake my cookies, I find they spread less and don't brown on the bottom as fast. If you are having trouble with your cookies spreading, refrigerate the dough until chilled, this will help! ENJOY! My daughter would love to be at your house on Mondays. She adores cookies and would love these. So would I. I love any kind of nut in a chocolate chip cookie plus you added caramel. Oh, I love these. I love nuts in my cookies too. Usually my kids rebel, but the caramel won them over they forgot the nuts were in there! The fat of the land, huh? In that case, I have a lot of land. Or a lot of fat. Because my freezer stash is HUGE. I’m more than a little scared of it! These cookies are fanabulous. Especially because you added caramel! And your kids are super lucky to have such a great Monday treat! These cookies look fantastic! I’m going to whip up a batch of dough and freeze it, right now! WOW, these cookies look sooo good! I’ve been meaning to make some cookies lately and these are perfect! These chocolate chip cookies are loaded with all the flavors I love. I’m going to have to try these. Oh gosh, Aimee.. you are mom of the year! Fresh cookies every monday? Will you adopt me?! Sure! What’s one more cookie eating mouth to feed?!? My kids would love the Monday cookie schedule. Makes me think I should start this to ease into the school year. These look delicious! I need to make these right now! These cookies!! I used not to like nuts in my cookies but now I am crazy about them. I need these! Very clever indeed! I’d probably resort to eating frozen dough though! 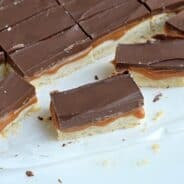 The caramel bits makes these cookies especially delicious! I love that Monday is your cookie day!!! I usually do Sunday or Monday too…that way we are stocked for the week. I don’t freeze the cookie dough though. I bag up the extra cookies in lunch box sizes and freeze those instead…if there are extras. Usually we give away half of what I make for different meetings. 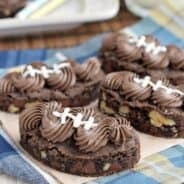 Decadent, chewy delight is RIGHT! These cookies are on-point, Aimee! Love them. 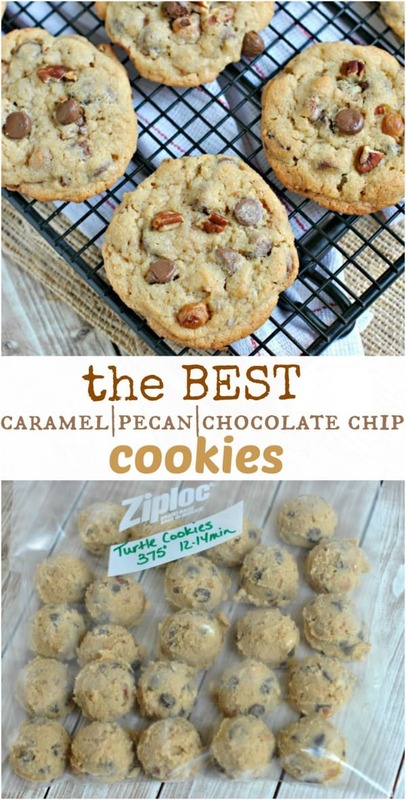 Loving the combination in these cookies–I haven’t tried caramel and pecans with chocolate but now it is on my list! Consequently tasty! That seems impressive. You had me at caramel and pecan. Girl, these look bonkers good. Cookies every Monday? I’ll be over with my sleeping bag. I love that you scooped out the dough for freezing–genius! Pinned. I love this idea to freeze the cookie dough! 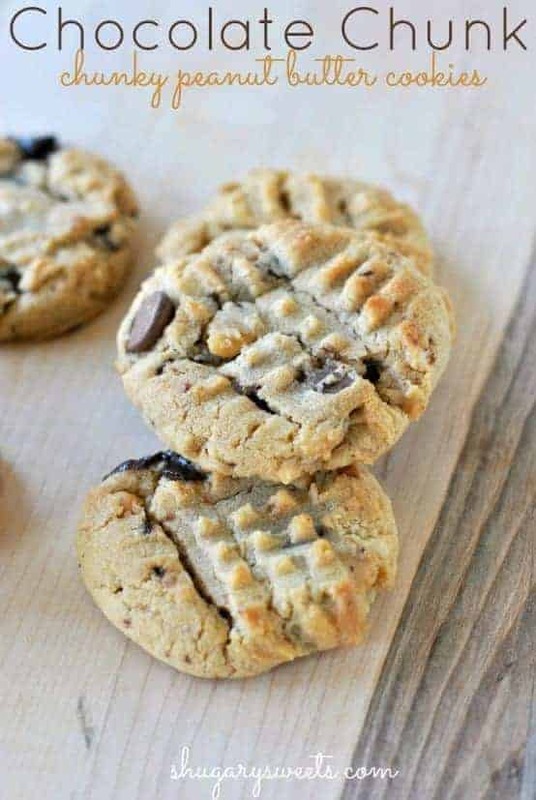 My son always asks for a cookie after school and this would be a great way to have them on hand. So mouth watering! That looks amazing. Caramel bits? Who makes them? I can’t wait to try these. These look amazing! I’m wondering about the baking powder? No baking soda? Kind of out of the ordinary, so I thought i’d ask! You said you “scoop out “balls of dough, what do u use when doing this? I use a 2Tbsp metal cookie scoop! I tried making these today. It was a complete failure. I followed the recipe exactly and the cookies spread into a sugary cookie glass. I made these cookies last year for a cookie party I went to they were the biggest hit! Going to make them again I’ll take pictures this time. 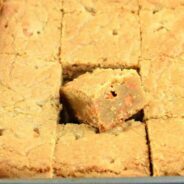 Quick question I made them the first time they where chewy and so good, but I tried to make them again about a month later but they were way to hard not chewy at all. I think I either put too much butter or not enough. Do you know or has anyone ever done that before? These sound so good! I will be trying these later this week after I get my summer tomatoes canned. Ha, I’m in the midst of all my summer tomatoes and zucchini right now. I feel ya!